What have you done? 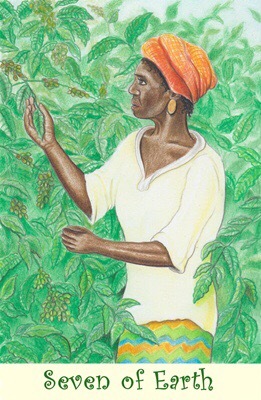 The 7 of Pentacles is a card of growth, assessment, and rewards. I always equate it as tending to the garden of life in order to reap great things. We are on the heels of the New Moon in Capricorn, and the Universe has been pushing most of you, in at least one area, to go for it. To take that energy and run with it and transform your life into something wonderful. Perhaps you have been feeling it in an expansive way, such as the urge to move outside of your comfort zone, and do something which allows the potential for tremendous growth in your life. I do not speak about all of the astrology, because this is a Tarot blog, but, the two are definitely connected. So, let’s just say that right now the Universe is conspiring to make you really think outside of the box, assess your life in such a way, so as to cultivate all of your hopes and dreams. It isn’t just a dream anymore, it is time to make it a reality. Do not expect overnight success; the New Moon in April will truly show you your potential, and you will be amazed. Remember, you reap what you sow. This entry was posted in Card of the Day, General Tarot, Love and Finance, Patreon, Readings, YouTube Videos and tagged 7 of Pentacles, Guidance, Path, Reading, Tarot.